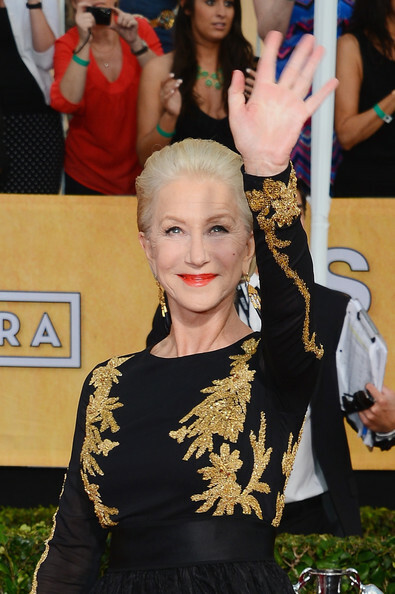 Speaking of grand dames and speaking of best dressed, Dame Mirren dazzled in black and gold Escada. I thought she looked, well, regal. The waves kept on coming, as that crinkled skirt billowed in the breeze. Helen Mirren is eternally elegant, in Escada. Was that zardosi embroidery, I wonder? Nails and lippy are perfection, and that ring needs to be kissed, while you kneel, of course. Holding up her Actor for her role in Phil Spector. More shining moments from the SAG red carpet, coming your way tomorrow. There was more Dame Dressing a couple of years ago at the SAGs. Images: 1, 3. Ethan Miller - Getty; 2. Frederick M. Brown - Getty.